The Wagner Super Finish SF23 Plus, High-Performance Airless diaphragm unit, for small to medium size projects and new construction. 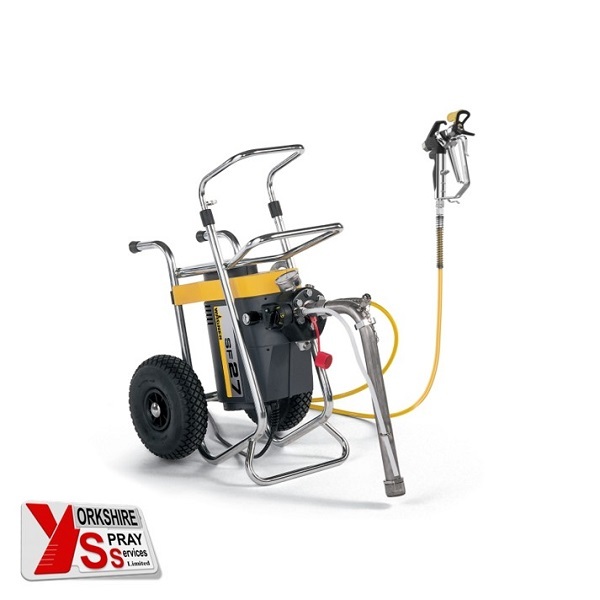 Application of emulsions in workshops or on construction sites. The Wagner Super Finish 27, High-Performance Airless diaphragm unit, for small to medium size renovation projects and new construction. Application of emulsions in workshops or on construction sites. The revolutionary QLS technology (Quality-Long-Stroke-Technology). The new generation of the patented long-stroke diaphragm technology is standard equipment in each Super Finish unit. The lower stroke frequency considerably reduces wear on the components, thus offering a longer service life and a minimum of maintenance. Exceptionally Durable – Proven diaphragm technology with Innovative QLS technology. Flexible – Small volumes can be handled using the hopper while other work can be performed directly from the original container. Robust & Reliable – The lower stroke frequency considerably reduces wear on the components, thus offering a longer service life and a minimum of maintenance. Versatility – One pump, many possibilities. Perfect – for site work, manoeuvring on building sites has never been simpler thanks to the unit’s robust trolley and large wheels. The Super Finish 27 + Electric Piston Pump. Ideal for larger residential, commercial & maintenance applications.